Microsoft has finally locked up rival Yahoo in a long-awaited Internet search partnership. After years of failed courtships, Microsoft appears to have finally won over Yahoo in a long-awaited Internet-search deal. The new partners' aim: narrowing Google's massive lead in the most lucrative piece of the online advertising market. The agreement announced Wednesday gives Microsoft access to the Internet's second-largest search engine audience. It adds a potentially potent weapon to Microsoft's Internet arsenal as the software maker girds for an online assault against Google. Yahoo is teaming with Microsoft following years of financial decay. In the process, Yahoo hopes to recover some of the money that was squandered in 2008 when it turned down a chance to sell the entire company to Microsoft for $47.5 billion. Microsoft wants to process more search requests because the inquiries have become a critical lever for selling Internet ads. The PC-software giant had an added incentive to unveil the terms of the partnership within the next day because its annual meeting with analysts is Thursday. It would make sense for Microsoft to use that forum to explain its rationale for the Yahoo alliance, said Brigantine Advisors analyst Colin Gillis. Microsoft, the world's largest software maker, has been pursuing Yahoo for several years in hopes of expanding its share of the lucrative online search market. After being repeatedly rebuffed, Microsoft launched an unsolicited bid to buy Yahoo in its entirety. With cofounder Jerry Yang at the helm, Yahoo put up such staunch resistance that Microsoft withdrew its last offer of $47.5 billion, or $33 per share, nearly 15 months ago. Yahoo shares have been sagging ever since, although they have been rising in recent weeks in anticipation of a Microsoft search deal. The stock gained 22 cents to close Tuesday at $17.22, then climbed another 17 cents in extended trading. 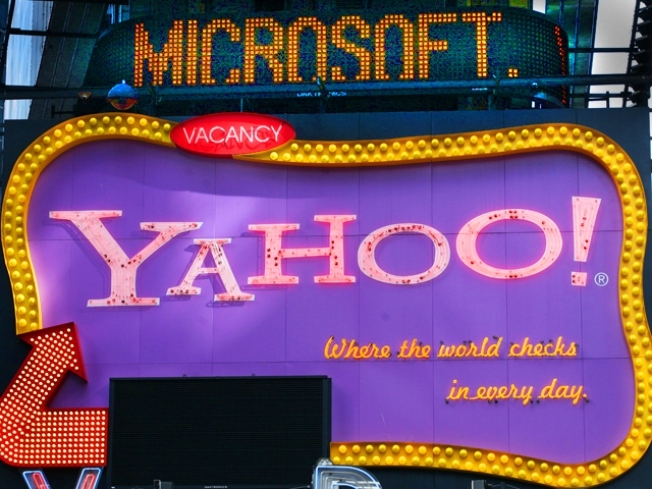 Microsoft is counting on Yahoo's search engine, which ranks No. 2 with a worldwide market share of 8 percent, to pose a more formidable challenge to Google, which holds 67 percent of the global audience, according to the most recent data from research firm comScore Inc. In the United States, Google's share is 65 percent compared to roughly 20 percent for Yahoo. Despite spending billions to upgrade its search engine, Microsoft still held just a 3 percent share worldwide and 8 percent in the U.S. As part of its latest improvements, Microsoft renamed its search engine Bing. It's unclear whether Yahoo will be required to promote the Bing brand on its highly trafficked Web site as part of a deal with Microsoft. Bartz has been testily dismissive of Bing in recent interviews and public appearances.